The only deterrent to creating a much desired oceanfront public community park at the North End beach in Asbury Park is iStar Financial/Residential. 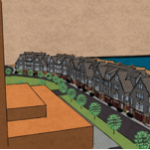 iStar has the development rights to build townhouses on the Ocean Avenue public right-a-way in front of Asbury Tower to the Loch Arbor border. This development would not only block open view corridors to the ocean over Deal Lake from Interlaken, Loch Arbor and Wanamassa but block the view for seniors at Asbury Tower; many who are unable to go to the beach or walk on the boardwalk. 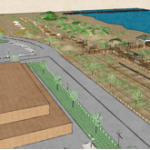 Also the townhouses would be built directly adjacent to public oceanfront and lakefront lands creating privileged public access to these areas. The outcry and opposition of this development began over 10 years ago. Started by a small group of seniors, calling themselves Citizens for Oceanfront Preservation, speaking out at Asbury Park Council and Planning Board meetings. They were joined by Joe Woerner of the Jersey Shore Surfrider Organization after one of the meetings. Within a few years many NJ and National Environmental groups such as American Littoral Society, Clean Ocean Action, NJ Audubon, NJ Chapter Sierra Club joined us for a 13 member Coalition for Oceanfront Preservation. 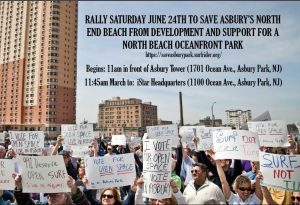 We stand together along with hundreds of citizens from Asbury Park and beyond in opposition of any further development on our oceanfront that threatens harm to our land and waterways. We want to create a park with a living, vibrant shoreline to buffer against future coastal flooding and sea level rise, safeguard environmentally sensitive coastal ecosystems, provide safe nesting areas for our endangered shorebirds, and keep direct, unrestricted public access to our public beaches, Deal Lake, and ocean. Come rally with us 11 a.m. Saturday, June 24 at the North Beach site, the last natural oceanfront resource area in Asbury Park.